The Basilica of the National Shrine of the Immaculate Conception is the largest Catholic Church in the United States and the tallest building in Washington, D.C. Construction of it’s Neo-Byzantine architecture began in 1920 and the church opened unfinished in 1959. Its Greek-styled interior is crowned with numerous domes decorated in mosaics, similar to the Basilica of St. Mark in Venice, Italy. The exterior of the Basilica is 459 ft (140 m) long, 240 ft (73 m) wide, and 237 ft (72 m) tall to the top of the cross on the dome. The tower stands 329 ft (100 m). Over the years, many miniature souvenir versions have been produced of this building. The best know are the somewhat common pot metal replicas, which come in both a small and larger size. The larger size is out of proportion as its dimensions are square rather than rectangular like the real structure. 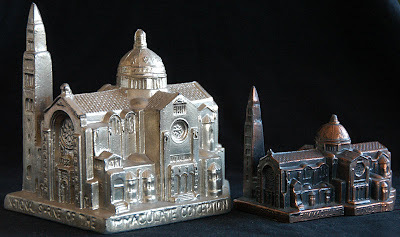 The larger version measures 5.5 inches tall and come in either a copper or gold finish. 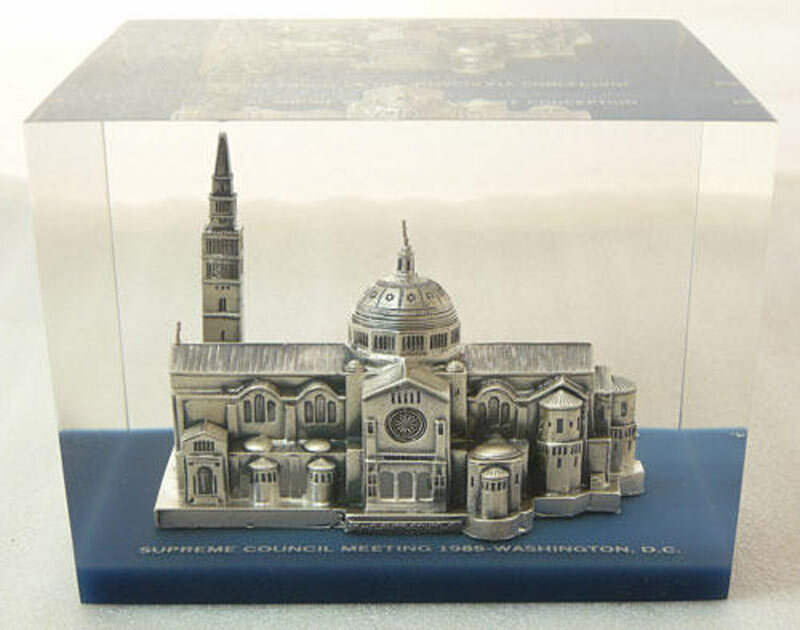 I’ve seen newer resin versions in various sizes and one of the best I’ve seen is a very detailed pewter-colored replica encased in a block of Lucite.